Weedy small loch - but which Loch .. Lochandubh is a bit far and behind Letterwalton lands. What is this : ( Highland Monthly II , 430 ) the verse occurs in a poem ascribed to Fear Fheurlochain , i.e,, the Goodman of Feurlochan in Benderloch2 . 31. Letter from John Stewart, notary, addressed 'sir', n.d. [perhaps 1664]. Jonet McDougall, 'your mens father sister', has liberty to sow the present crop and stay in Ferlochan till 15 May next: she has six horsegang in Ferlochan, paying for each horsegang three bolls meal, one boll bere 15s, for tartan 15s, for butter etc., and her proportional part of three wedders which are paid by the whole town; other horsegangs. West Ferlochan is opposite the junction where the road to Barcaldine Castle past Dalintober meets the main A828 road, you are likely to see some wonderful Highland Cattle here. The ancient family of Ferlochan was the McPhederan's who were mostly based around Loch Fyne and Glenaray, they were blacksmiths .. reputedly producing top quality arrows and swords at their forge at Park farm, Ferlochan. It is possible that the forge area used by travelling smiths in generations later has been found by Rhugarve slip. Their swords were said to be of outstanding finish and quality. Title Letter from Duncan McIntyre and Peter Sinclar, Acha, to Alexander Campbell of Barcaldine, advocate. Description Reminding Barcaldine that he has promised them the park of Ferlochan. Dated at Rugarve. The inauguaral 1845 Parochial board meeting mentions "Donald McDonald Ferlochan Crofts [dead]" and "Margaret McIntrye Ferlochan [dead]" as a couple of the paupers of the parish. Jean Carmichael Ferlochan to receive ten shillings of occasional aid. Widow McDonald or Mary Cunningham Ferlochan As her family are all grown up and should be able to assist and that she appears to enjoy good health and lives beside her brothers who are farmers from whom she has a free house and potato ground her admision on the roll is in the mean time is refused. We have the rest of the census records to add here . 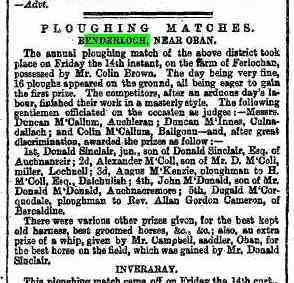 Ferlochan : Ledaig (4), Argyllshire : D. Mackenzie, farmer; and D. M 'Arthur. We have Valuation roll search results to add here, you can search them yourselves in the page linked above, but we do not have copies of the records yet. The eviction main is beginning to make itself felt nearer home, casting it's evil blight over the peaceful inhabitants of Lismore and the humble tillers of the soil around the margin of the lovely Loch Nell. We mays as well explain - or rather a portion of it, as Mr Allan Grant Cameron, the laird retain about a third - was purchased by Mrs Ogilvie, belonging to Suffolk. She only entered into possession in November but her efforts to oust the tenants on the estate have been so vigorously prosecuted and so persistant that already more than half of them have been deprived of their holdings. The farmers who have left the estate are Messrs MacIntyre, Home Farm, Buchanan, Achinreir; and Alexander and Duncan MacArthur, Mill Farm. The crofters are :- Messrs John Ferguson, Crigan; John MacKenzie, Achawe; Donald Clark, Dalronach; Peter MacIntyre, Ferlochan Park; Archibald MacIntyre, Rhu Garbh; Archibald Cunningham, Slochanluaidh; Alexander MacDonald, Achinreir and the Widow MacDonald.